Turn off the lights and buckle-up. 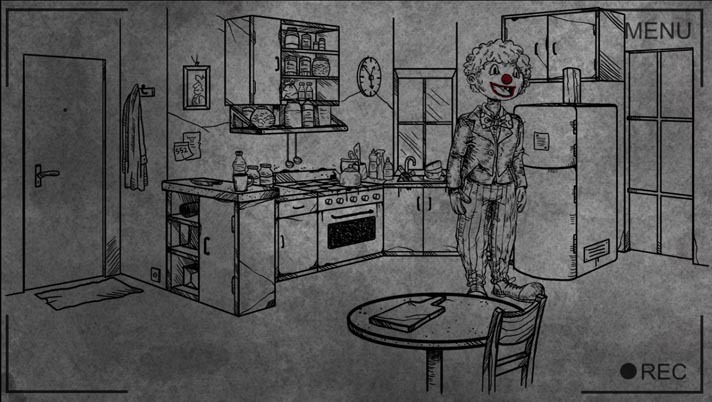 Because Bad Dream: Coma is about to take you on a psychosomatic clicking adventure, courtesy of the nightmarish imaginations of the developers at Desert Fox. Coma is the next installment of the acclaimed horror point-and-click Bad Dream series, and not only does Coma do justice to the series, it also pays homage to its predecessors. With all of the macabre of Shelley and Lovecraft, Bad Dream: Coma entices the player into making decisions that range from seemingly benign to absolutely beastly. The art retains a sketchy feel, yet with horrifying detail that is stylistically reminiscent of Roman Dirge’s Lenore comic series. The entire game appears as though it has been sketched onto paper, complete with coffee stains and wrinkles in the page that litter the background. The only color that regularly appears is the red blood that gushes from people or animals that you decide to maim. If you click on something dangerous, like a thorny flower, broken glass, or terrifying clown toys, the cursor will begin to bleed for a few moments, permanently staining the page with droplets of blood. Every time the player goes back to that page or scene, the blood droplets will still be there, reminding the player of her many costly mistakes. The coolest thing about this sketchy art style is how the developer played with it, forcing the player to think outside of the box. Some of the puzzles require the player to use objects to cut, tear, draw, or erase different aspects of the environment, which only adds to the surrealist atmosphere. Because of the premise that everyone in the game’s world is in some sort of shared dreaming experience from which they cannot wake up, the feeling of hypnagogia is the driving force in the narrative. Everything in the story and gameplay follows a sort of dream logic, meaning that characters, decisions, and consequences all have this eerie quality about them that wouldn’t make sense in the real world. One main theme in the game is immortality: nobody can die, no matter how badly maimed. This leads to fun visuals, including a man grasping at his own exposed intestines, people with bloody, hollow sockets where their eyes should be, and a completely pulverized pile of goop that twitches with the human spirit still painfully attached - “fun,” is a relative term here. Decisions are important in Coma, and the right decision is not always completely apparent. When I first started this game, I was having a bit of trouble with my headphones and played my first fifteen minutes with no sound. That was a big mistake. A great deal of the creepy aesthetic is attributed to the eerie and disturbing music and atmospheric sounds by Michał Ratkowski. Once I fixed my headphones, it completely changed the feel and play of the game. The songs are a medley of discordant notes and quiet sounds of haunting ambiance. 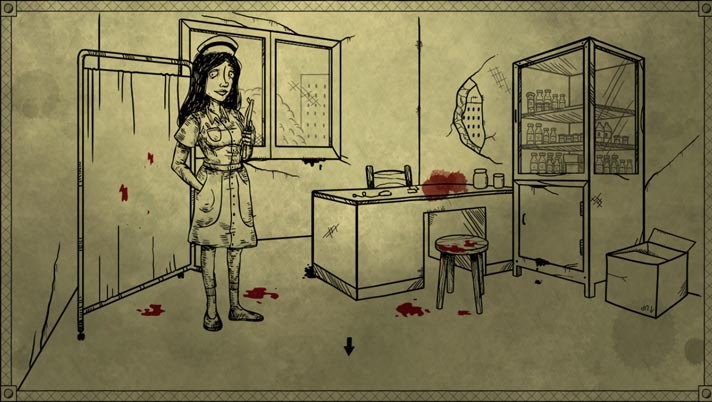 The one element that stands out in Coma is the painstaking attention to detail. Just as the player-created bloodstains stay throughout the entire game, so does any bodily harm to the character. There may be a point where the main character’s fingers are amputated, and the cursor hand will be missing fingers for the rest of the game. 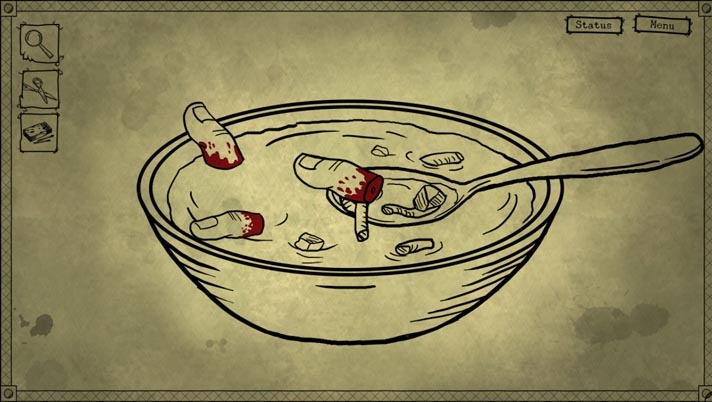 Even if the player figures out a way to attach more fingers, the cursor hand will be bloodied and the fingers will be glued on haphazardly. This is where point-and-click adventures can go from good to great. The developers at Desert Fox obviously put an enormous amount of work into ensuring that the details in the design were as comprehensive as possible, and the game is great because of it. Even when the player is stuck on a puzzle and furiously clicking around the screen, the artwork and detail can still make it an interesting experience. Whether you are new to the series, or just looking for a creepy game to mess with your perception of reality, Bad Dream: Coma is not one to miss. The atmosphere is dark and gritty, and the player has the option of making it darker and grittier with their decisions. There are tons of challenging puzzles and secrets to unlock, and many different avenues for the narrative to take. In fact, almost the entire narrative is based around actions and consequences. The developers attention to detail is exemplary, freeing the player to enjoy entirely different scenes based on even small changes in actions.